Mammon, also know as the "Lord of this World" or "Lord of Greed" in my games made his AD&D debut in "From the Sorcerer's Scroll: New Denizens of Devildom," in Dragon #75 from 1983. He later was featured in the Monster Manual 2. 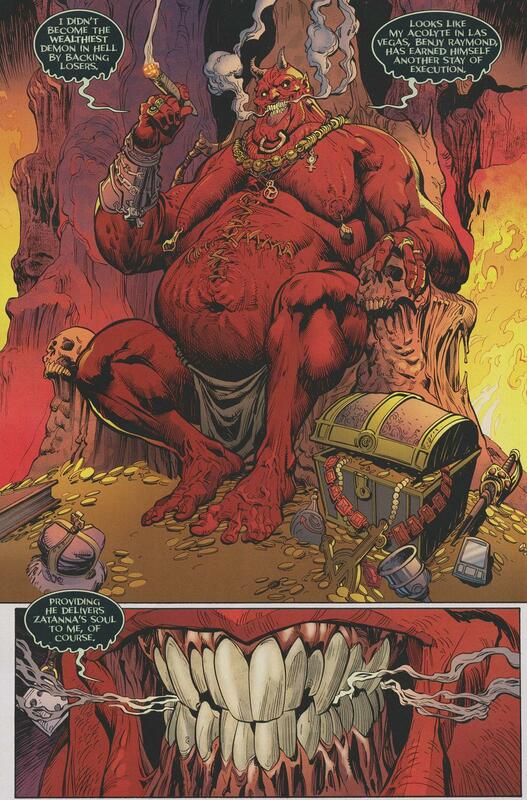 Though the Mammon he is based on is actually a much more interesting character. He appeared in the Milton's Paradise Lost, Edmund Spenser's The Faërie Queene, the New Testament and has roots in earlier myths as well. There is a lot of debate about the roots of his name, but it is almost always connected to money and/or greed. 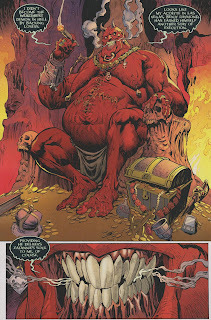 He is almost always depicted a large, fat devil with red skin, bald head. I most respects his appearance is supposed to represent the over-indulgence that greed and avarice can lead too. Compare if you will the AD&D version and the DC Comics version I posted on Saturday. In my games Mammon is the lord of Greed and one of the Baalseraph. Not all characters have to be complex and Mammon is a good example. He fell because he wanted more. He was greedy and that lead to his downfall. It is believed that he is akin to the Roman god Pluto who also protected the riches of the world. This in a way makes him kin to Dispater (another AD&D Devil) who also has his roots in Pluto/Hades. So in my games I would make Mammon and Dispater bitter rivals. Each trying to out-do the other in opulence and overt expressions of wealth and greed. Mammon would be the physically more powerful devil, but Dispater may have more influence. It is not a stretch to think of Mammon a bit like Jabba the Hutt. In fact that may have been the idea on his new form in the 3rd and 4th edition materials. Another good example is Kingpin from Marvel Comics. Mammon is the archetype of the fat, bloated crime boss surrounded by loyal henchmen, women (in this case Succubi) and wave upon waves of goons. Special: +2 or better weapon to hit, immunity to fire, electricity and poison, regeneration (2 hp/round), see in darkness, magic resistance (75%), telepathy 250 ft. When a mortal makes a deal with a demonic entity for riches, it is most often Mammon at the root of it all. His "standard contract" is wealth and power for a set number of years. Afterwards the contracted party forfeits his soul to the Baalseraph lord and all the riches return to him. There are plenty of tales where the summoner, knowing his time is running out, attempts to trick or fool the devil into letting him out or granting him more time. Mammon is very cunning and usually gets his way. He rarely if ever enters into combat himself. He has a retinue of lesser Baalseraph, Pit fiends and other demons to aid him. If he must enter into combat he is perfectly capable of defending himself. Interesting. What comic is the DC page from? From the Paul Dini run of Zatanna a couple years back. I've always liked Mammon, but had never thought about the Kingpin comparison. It's perfect.